Beautifully engraved Certificate from the Allegiance Telecom. This historic document was printed by the Security Columbian Banknote Company and has an ornate border with a vignette of the company's logo. 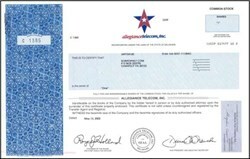 This item has the printed signatures of the company's officers including Royce Holland as Chairman. 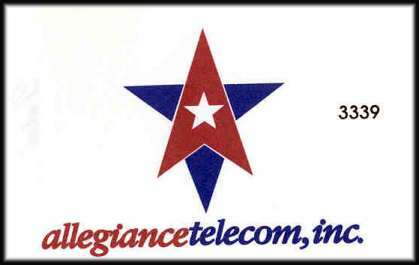 Allegiance Telecom, Inc. was built to provide businesses with all the advantages of competition - higher service quality, competitive pricing and technological advancements. In short, we offer state-of-the-art telecommunications products - voice, data and Internet - all from a single source, on one affordable bill. Our infrastructure is based on the latest developments in network operations, engineered to provide businesses with cutting edge products and truly exceptional customer service. The company's stock traded over $100 a Share in March 2000 and now is trading around $1 Share.